FILE: Chief Justice Mark Recktenwald administers the oath of office to HPD Police Chief Susan Ballard. 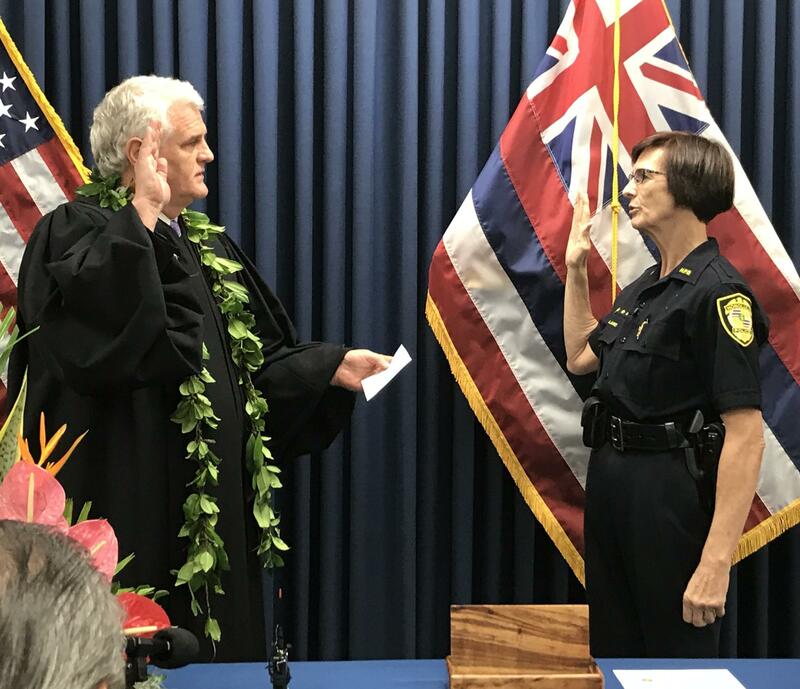 The Honolulu City Council has agreed to pay $550,000 to a retired police lieutenant who claimed that Police Chief Susan Ballard had tampered with recruits' test scores when she was in charge of the training division. The council approved the payment Friday to settle the 2009 lawsuit filed by Deeann Koanui, who retired last year, the Honolulu Star-Advertiser reported . Koanui had claimed Ballard was involved in tampering with scores on physical and written tests and ordered the destruction of incriminating documents. Koanui had special training that permitted the department's programs to be nationally certified. She oversaw physical and other tests of recruits. Five recruits failed a retest on property crimes in April 2008, according to the lawsuit. These recruits should have been terminated, but Ballard or another officer gave them passing scores, the suit said. Koanui also claimed she faced retaliation and harassment beginning in September 2008 after she started reporting issues to the department's internal affairs office. "Lt. Koanui put her heart and soul into making the department better every day she was on the job and filed this lawsuit to try and further that effort," said Carl Varady, Koanui's lawyer. Ballard did not return the newspaper's request for comment. Honolulu Police Commission Chairwoman Loretta Sheehan also did not return a call for comment late Friday. In a statement, the police department said the suit was "amicably resolved." "I think the settlement speaks for itself, and if you look at the time and effort she put into seeing this through to resolution, it's just a reflection of her commitment to a police force that exemplifies the best values," Varady said.